There are three big reasons to make spring rolls a couple times a week all summer long. Firstly, you get to enjoy the best summer ingredients in their raw glory, or alternatively, the best fresh ingredients you can get while you’re cruising really shine in a spring roll. Second, because all you do is boil a bit of water, it’s an easy cook and clean. I normally get away with a quick wipe of the bowls when I’m done. And then finally, they’re flexible. Anything goes for ingredients with these things, so like all the other recipes I like to share, here’s a roadmap rather than directions so you can make these with all your favorite stuff. Wrappers: Choose the ones that the clerk at your Asian grocery suggests. Some brands break easily, some are too thin or thick. Ask for help. Grab lots of them and keep them in the larder on the boat or at home on land. It’s a pantry staple for me. Noodles: Rice vermicelli. To soften the noodles, just boil up a kettle of water. In a bowl, put the amount of noodles you think you’ll need and pour over the water. Cover with a plate, they’re done in a few minutes. Water-saving boat tip: Save that hot water aside, you can use it to soften the wraps later on with a little added hot water still left in the kettle. Fillin’s: It doesn’t take a lot of food to fill a rice wrapper and if you’re going to use noodles, it stretches the good stuff. Even if you just have a few things, I bet you can get a nice yield of spring rolls to please your crew. Last night, I piled in 8 or 10 French breakfast radishes I grew m’ self, 4 little white turnips, 2 carrots, mint leaves, and a few leaves of napa cabbage. Any cabbage will do, removing the outer leaves so the rest of your head of cabbage lasts longer (I used to just cut into the head for shreaddy cabbage- it lasts longer this way). Roll them up and chiffonade. No noodles in the pantry? Just do extra cabbage to fill up room. If you’ve got the patience, cut root veggies into match sticks for maximum pretty. Other fillings to try: japanese pickles, sauerkraut, kim chi, thinly shaved salami, marinated tofu, grated raw beets (chioggia or golden work awesomely), peppers, chives, whole cilantro leaves, fresh green beans, scrambled egg with a little mirin in it (kind of like tamago), edible flowers that show through the wrapper, and pretty much every single green ever. 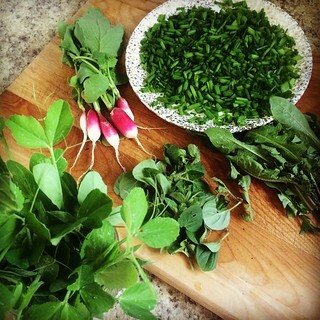 Below: Pea greens, dandelion greens, radish greens, baby greens, and chives. Assembly: The best tip I ever got from my local Asian grocer was to have a bowl of hot water (I normally use my biggest frying pan for it) and to dip the wrapper in for just a few seconds. When you put the wrapper down onto a cutting board or counter so you can fill it, by the time you’re done piling the fillin’s, it’s just perfectly gummy and ready to wrap up. Here’s a tip from me- put all your pretty stuff down first. I do this in a little line in the middle of the wrapper, from left to right in front of me. Lay down a cilantro or mint leaf, then line up some pretty red, orange, yellow, striped, beautiful things on top, then some cabbage, and finally a little handful of noodles. I just get into the noodles with my mitts and tear a little handful. For consistent sizes, you could measure everything. Eyeballing is totally fine. I make them about the width of my hand and about an inch or so around- easy to bite. If you stacked it like I described, you’ll have a little leaf or your brightest ingredients showing through the top of the roll. Also, if you’re going to tote these to a potluck or a dinghy raft up, they might stick together. I pour a drop of olive oil in my hands, rub them together, and run my hands around each roll, refreshing the olive oil supply in my hands from time to time. They come apart like a dream later on. Dippin’ Sauce: I guess you could buy something, but build out your pantry so you can make dressings for everything all the time, and you’ll be ready to make a top notch dipping sauce. I do bout a half cup of tamari with a couple top notch modifiers. Por ejemplo, you could do a couple tablespoons of brown mustard or wasabi if you have it, fish sauce, mirin, chopped peanuts, chopped onion or chive, apple cider vinegar, rice vinegar, Singha beer, a bit of honey, red pepper flake, sriracha, that sort of thing. My go-to? Tamari with the brown mustard and a bit of vinegar with floating goodness like chopped peanuts. The only thing to do now that all this is done is to make sure it’s cool with your friends to double dip, because you’ll want that awesome sauce on there. I’m half kidding. Think ahead and have a spoon for your dipping sauce bowl though. I like to take a bite of a roll and then spoon the sauce right down into it. Enjoy, and let me know what you come up with! 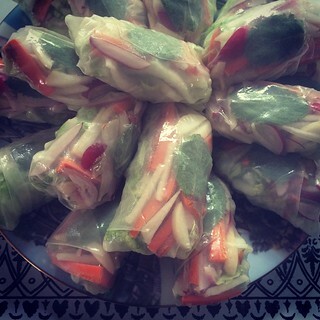 This entry was posted in From the Galley and tagged boat, cooking, cruising, dinner party, easy, fast, fresh, gf, gluten free, pantry, potluck, sailing, spring rolls, vegetarian on June 12, 2015 by Anne.